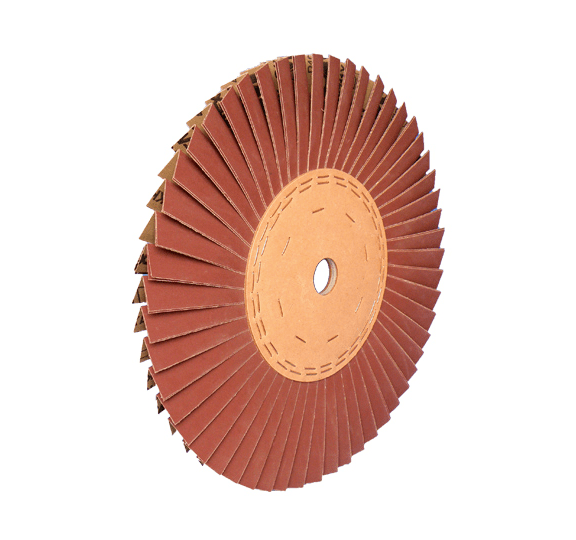 The FAPI-SAND folding abrasive mop consists of interfolded abrasive cloth flaps in a synthetic resin bond, sprinkled with corundum, which are arranged fan-shaped and radially around a solid core. This makes the tool very flexible and perfectly adapts to the contours of the workpiece to be machined. You can choose between a clamped or glued version. The folding sanding mop FAPI-SAND is the ideal tool for fine surface sanding and is particularly suitable for processing joints, grooves and gorges. It can be used on all types of machines (hand grinders, stationary grinders, automatic grinders, grinding blocks, flexible shafts, etc.). This makes the folding sanding mop FAPI-SAND a flexible tool for almost all branches of industry (container and apparatus construction, precision mechanics, mould construction, metal processing, processing of rims, pipes, extruder worms, fittings, tools, profiles and fittings, production of cooking pots and cutlery, etc. ).